Every time I visit the Kingdom of Saudi Arabia, I can't help but relive my childhood. Even though, from a week before I get on the plane I get all dramatic and weird about being bored for a whole month. But this time it was different. I do not know why or how, but there was something different about this year's trip. I go once every year to visit my father, who works at the Kingdom, and it's always the same thing over and over again -- eating good food, visiting family friends and people I grew up with. Visiting Richard Brown, my high school English teacher, was one of my favourite parts of every trip. He was like my best friend when I used to study in Bangladesh International School, English section, Riyadh. After his death on April 25, 2009, I have been very reluctant to even visit my school. This year, though, my father suggested I visit the school. As I walked in the school, a blast of nostalgia hit me. Everything had changed -- the sections were separated, the kids who I left as 10-year-olds were now seniors, there were new teachers and new faculty members but somehow it was still the same place that I spent my childhood years in. The best moments of my life began and ended in that school. I remember not hesitating when it came to going to school every morning. I would wake up excited to see all my friends again and have fun in the break time. I went and met the principle, MSM Hussain, who had joined a couple of months before I left. He told me about how the school had changed and while I was sitting there and listening intently, I could not help but quiver in excitement to take a tour of the school and take a long walk down my favourite memory lane. The first thing I did was walk into Brown's old office and before I knew it, I got all teary eyed. I just stood there for a while trying to think of ways to somehow maybe talk to him. I got as dramatic as people do in movies and started thinking of how proud he would have been of me if he were still alive. I did everything he thought I would be able to do. He was one of the fewest people who believed in me and knew I would make a name for myself someday. I walked through the halls and the courts, the auditorium where I performed my first ever dance before taking on the challenge of becoming a professional dancer, the library where we hid while bunking all those classes. 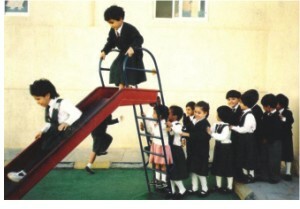 Everywhere I went, I saw myself and all my friends -- Tahia, Afnan, Ridi, Tiba, Jessica, Zanifeer, playing around, laughing. I met a couple of my old teachers like Nisha Thomas and Arif Halim who were the two individuals who took my interest in Biology to a whole new level. As much as I hated the thought of visiting the school, every single minute that I spent there brought a smile to my face as my whole childhood came back to me. I realised how much of an important part of life it is. My childhood, my first ever school, my first friends and my first teachers, this place is where I got all of that from. Bangladesh International School gave me my first identity and I will always remain thankful to the school for being a part of my life and helping me to believe in myself. I am what I am today, because of my school.